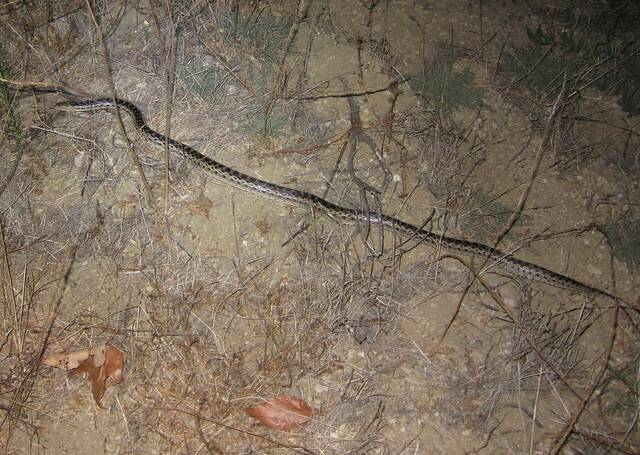 A couple of weeks ago, Ken and I went on a nighttime nature hike in Penasquitos Canyon. (That's the canyon where we found 100+ geocaches last summer, so we know it very well. We haven't been back much since then, though, and it's a lovely place, so this was very nice.) There were maybe twenty people along, including a bunch of kids. I think it's great to get kids interested in nature, but I have a rather low tolerance for yelling and stuff, so it did get a bit wearing at times. But we tried to stick close to the hike leader and listen to the stuff he was telling us, and the kids often ran ahead or trailed behind. 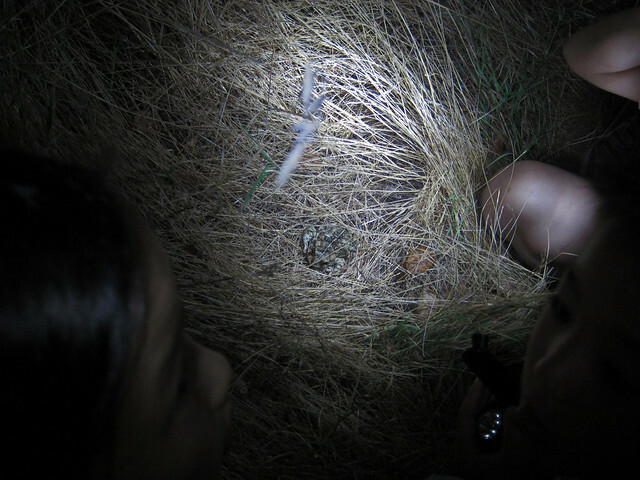 One girl was very interested in the grasshoppers hanging out near the toad, and I helped her catch one. I was a great catcher of grasshoppers in kindergarten. I am really awkward around kids, but grasshoppers cross cultural boundaries. 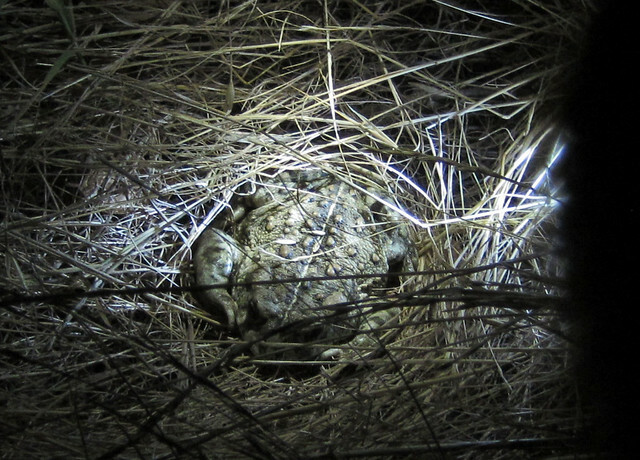 Ken also spotted a raccoon in his flashlight – just the eyes, reflecting the light back at him. The eyes kept popping up to standing-raccoon height, and then dropping back to crouching-raccoon height, as it tried to get a better look at us. So the hike was fun, and we may have to do another one sometime. 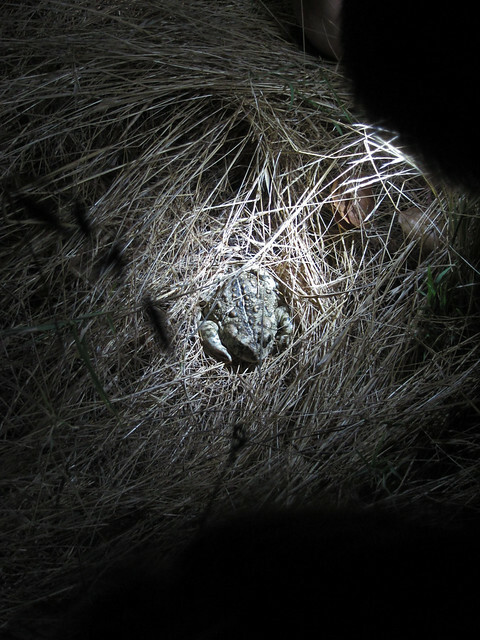 They have several themed hikes – this was to look for night critters, so it was obviously successful! They mentioned tarantulas, though, and I was somewhat disappointed that we didn't see any of those. I know they live in the canyons, but we've never seen one. We have seen "tarantula hawks," the giant wasps that prey on them. Those things are creepy. But awesome. Then last week, on my day off, I was hanging out in the living room when Toeffe lunged at the patio screen door. I thought he'd just seen a bird, but he kept making these low growly noises and staring, so I went to see what he was looking at. I've only seen two of these before. 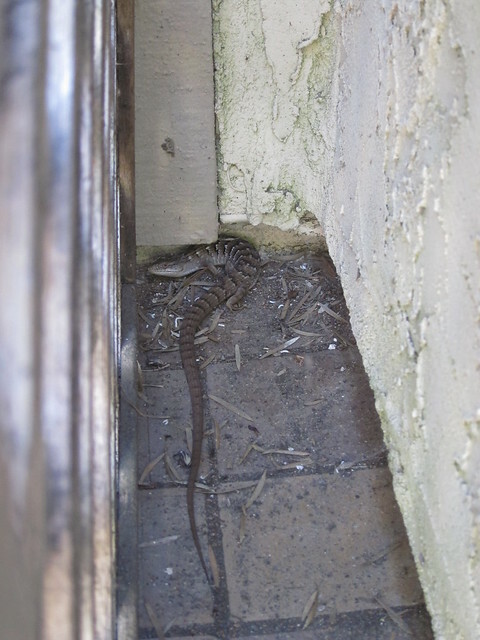 We see tons and tons of little fence lizards on the trail, but rarely alligator lizards. I'm not sure why; they're extremely common. But here's one on the patio! It hid behind a trellis until it was sure Toeffe wasn't really coming after it. I measured it at about 15 inches long, but at least two thirds of that was tail. 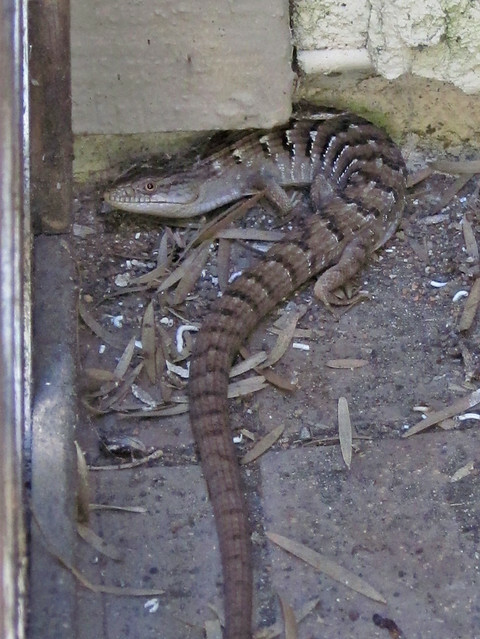 I read that these lizards drop their tails when they get caught; they can grow new ones, but the new tail is never as long or brightly colored as the original. So I think it's safe to say this lizard has never lost its tail. Eventually it moved on, so Ken didn't get to see it when he came home. Toeffe would not leave the patio door for hours, even after the lizard was long gone. I finally carried him outside and showed him that nothing was behind the trellis anymore. I don't know whether he understood or I just distracted him from his vigil, but he wandered off after that. Then last night we had to find a geocache (it was an empty day on the calendar), but we put it off till after dark. We're running out of easy local caches to do on days like that, so we had to pick one a couple of miles from home. We weren't expecting that section of road to lack a sidewalk, but we were able to walk in the weeds behind a guardrail. 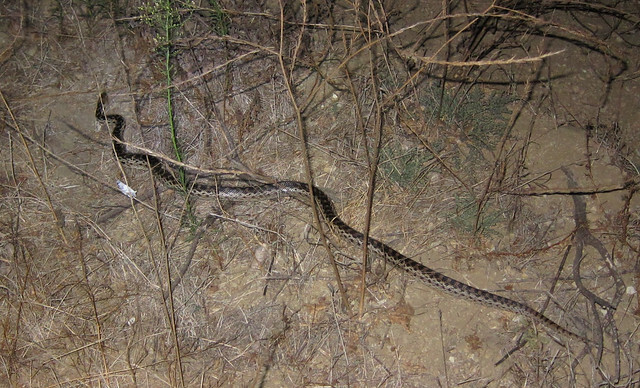 That's a gopher snake. They're harmless, generally even friendly. 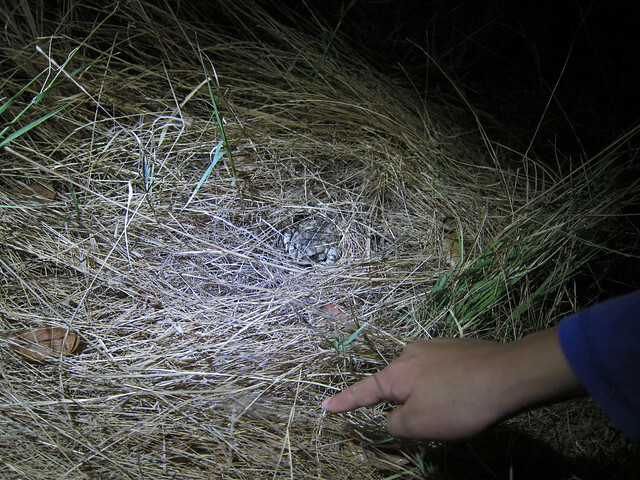 I was surprised to read that they're sometimes mistaken for rattlesnakes; I guess the dramatic pattern is eye-catching, so if all you get is a glimpse or can't see the head you might worry. 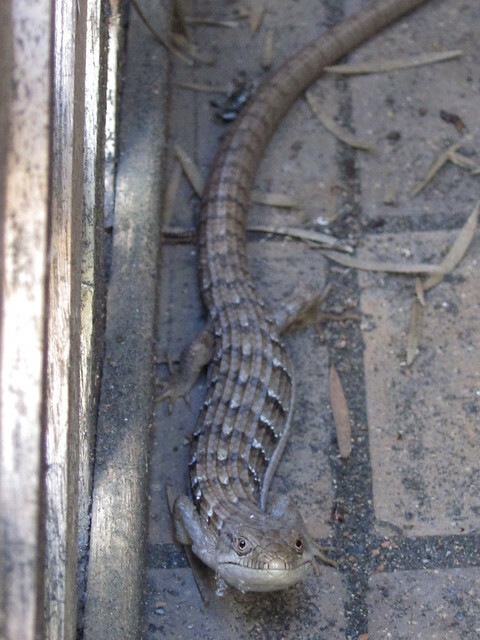 It was at least four feet long. Pretty cool. Made up for wading through all those weeds. And that's this month's installment of Critters I Have Seen. Tune in next month!